As part of its sweeping overhaul of fisheries legislation, the federal government will ban the capture of cetaceans, marine mammals like whales, dolphins and porpoises. The change, just one sentence buried in the 76-page fisheries reform bill, is a victory for animal welfare activists who have long argued holding these highly intelligent creatures in a tank is cruel and a perverse form of entertainment. While others, including the Marineland amusement park in Niagara Falls, Ont., have said such a move would devastate attendance — and threaten conservation efforts — at theme parks where these animals are on display. Bill C-68, introduced on Tuesday, allows the minister to make exemptions for cetaceans that are injured and those that need to be rehabilitated. There are only two facilities in Canada, Marineland and the Vancouver Aquarium, that currently hold these mammals. The Vancouver Aquarium, which has long maintained captivity serves both scientific and educational purposes, recently said it would no longer display whales or dolphins at its facility as protests over captivity have become a “distraction” for the business. Changes proposed in LeBlanc’s legislation come as the Senate is debating a similar bill that goes further — banning the captivity and breeding of such mammals through amendments to the Criminal Code. Fines of up to $200,000 could be imposed, a deliberately high amount designed to deter captivity. That bill, S-203, first introduced by Liberal Sen. Willie Moore in December 2015, with the backing of Green Party Leader Elizabeth May, has had a slow go through the upper house. Moore has since retired. 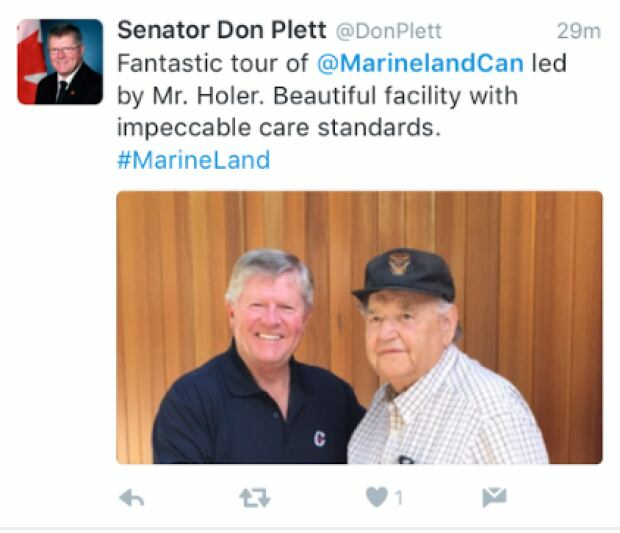 Conservative Sen. Don Plett, who is steadfastly opposed to the Senate bill, has continually sought to put off a vote through the creative use of some parliamentary procedure. The Senate fisheries committee, of which Plett was a member, studied the bill for some eight months over 17 committee meetings with more than 30 witnesses — considerably more time than a Senate public bill typically spends under scrutiny at committee. “I certainly welcome what Minister LeBlanc has done here, on whales, I hadn’t expected to see this and it’s welcome,” she said, while noting the Senate bill is still necessary because it prohibits breeding, which is how parks typically grow the ranks of cetaceans. The Senate bill will also, through the breeding ban, phase out captivity over time, meaning Marineland would still be able to keep its current stock of some 55 cetaceans if it is passed. The hope of many activists is that some or all of the marine mammals would eventually be moved to an open water seaside sanctuary in either B.C. or Nova Scotia. May also said she has asked the lobbying commissioner to investigate efforts by both Marineland and the Vancouver Aquarium and the possible failure of these organizations to register as lobbyists despite their extensive outreach efforts to certain senators. May said she has not yet heard anything from the commissioner since her request was made in September 2017. A spokesperson told CBC News such investigations must be conducted in private. “The commissioner is unable to discuss or confirm investigation activities,” the spokesperson said. CBC News asked Marineland for comment but did not receive one ahead of press time. During an appearance before the Senate committee studying the bill last year, John Holer, the owner of Marineland, said he’d like to add more dolphins to his park in the future as he proceeds with an ambitious expansion. “We have five dolphins and we have not had any young ones. We are hoping that, someday, we would be able to get some more dolphins,” he said. May said while she is “sympathetic” with any proprietor who sees their business at risk — and the nearly 800 seasonal workers Marineland says it employs each summer — but she said Canadian “sensibilities have changed a lot” and Holer should consider adding other features to his park.